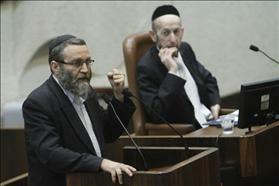 Chairman of the finance committee, Moshe Gafni from Degel Ha'tora, raising his fist during a speech at the Knesset assembly. Photographed by: Miriam Elster, Flash 90. "The Nation-State Law is a basic law that includes serious things. We do not want this. It is all apostasy from the first word to the last word... The Nation-State Law is a bad law... because of the conflict with the Arabs and the provocation of [other] nations... Why did we agree to it? Because Netanyahu said that this is a law that matters to him and in exchange for supporting this law, he will do what we demand in [regard to] the [IDF] Draft Law." As expected, a storms raged over Gafni's words, and he and the Prime Minister denied the existence of such a deal between them, but politicians' denials of embarrassing statements that become exposed are commonplace. Gafni's explanation that "his statements were taken out of context" is also a standard response to revealing of real statements that go against a politician's carefully cultivated public political persona. This party self-righteously claims to aggressively champion the cause of "true" Judaism, but they have no problem voting against their own religious values, as long as their sectarian interests are taken care of. This is seriously concerning on two levels. Given the acute public controversy over the Nation-State Law, and given that MK Gafni and his party consider it dangerous, harmful to Israel, and in contradiction of their religious worldview, the United Torah Judaism party's vote for this law was clearly hypocritical. This party self-righteously claims to aggressively champion the cause of "true" Judaism, but they have no problem voting against their own religious values, as long as their sectarian interests are taken care of. It is clear that while Israel faces difficult challenges (security, economic, societal, international, etc. ), all of these are unimportant in the eyes of the ultra-Orthodox parties and are dwarfed by their desire to ensure the continued mass exemption of the haredi public from bearing their share of the security burden. This is contrary to the will of the overwhelming majority of the Israeli public, against repeated Supreme Court rulings, and detrimental to Israel's security needs... And this is all in the name of a pretentious religious claim that the public rejects - namely, that the State of Israel's security and existence are maintained first and foremost by Haredi yeshiva students who do not serve in the military. The ultra-Orthodox parties have long been entrenched in the political system, for the leading civil parties prefer not to work with each other, but rather to consolidate narrow coalitions based upon the support of the ultra-Orthodox parties (according to Hiddush annual public opinion polling, the public is fed up with this). Now, these same religious parties are focused on trying to neutralize the only obstacle that stands in their way - the Supreme Court. In this effort, they consider all means legitimate. They have no probem undermining democracy, the rule of law, the independence and authority of Israel's judiciary - none of this matters to them. In fact, these values are an anathema to them and fly in the face of their desire to establish a halachic state in Israel, or at least to get as close to this goal as they can. It is against this background that one must understand Gafni's comments this week, when asked about the things that were heard in the recording, he made it clear who the enemy was in his eyes and what he thought of an independent judicial system in a Jewish and democratic state: "We believe that we exist thanks to Torah scholars since we first became a nation. We've had difficulties with the Supreme Court, which does not understand anything about [Torah]. They interfere in something that is not for them..."